* Trust in God, have hope in Him, and love Him, and He will not forsake you. For if men who are wicked, love their children, how much more must God love His? Now they are children of God who love Him and keep His commandments. Those, on the other hand, who do not love Him, do not believe in Him, and do not live in accordance with His commandments, and who do not love their fellowmen, especially the poor, giving them alms, are children of the devil. 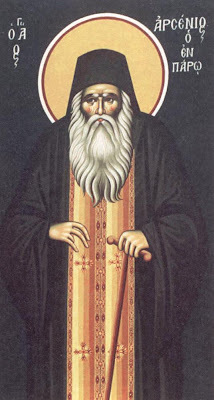 Saint Arsenios was born on January 31, 1800 in Ioannina, Epirus of pious Orthodox parents. In holy Baptism he was given the name Athanasios. His parents died when he was quite young. He was only nine years old when he made his way to Kydonia, Asia Minor, where he was received by Hieromonk Gregory Saraphis and enrolled in his school. His humility and piety endeared him to Fr. Gregory and also to the other teachers. The boy remained at the school for five years, surpassing the other students in learning and in virtue. The three perceiving the bodily members of Christ. From his body giving his hands and feet. Entered Diodoros the Martyr and he was crowned. And how will God bear me Sarapinos. And the sweetness of higher delights he gained. Being beheaded you ran to God on your knees. On the fifth Claudius is beheaded at the hands of murderers. And sends you undefiled to luxury. 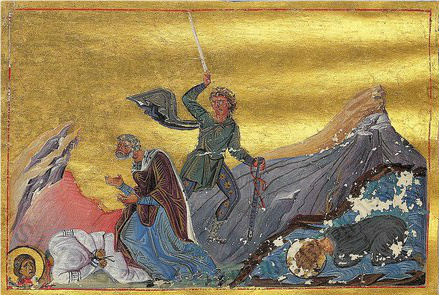 Saint Tryphaine came from Cyzicus on the Hellespont. The daughter of Anastasios, a Roman senator, she was brought up in the Christian faith by her mother Sokratia. 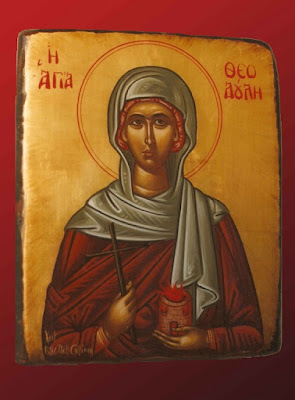 She was brought to martyrdom not by pagans or idolaters, but she herself went to the pagans and ridiculed the idols and criticized their wicked practices, which the senseless ones thought that by these they were honoring their false gods. Not only this, but she taught them to abandon their religion of vain idols, and turn to faith in Christ. Working miracles together even after the sword. With longing for the Father of all are killed by the sword. On the thirty-first Cyrus and John were beheaded. 1. Portion of skull at Vatopaidi Monastery in Mount Athos. And readily did he receive an unfading crown. Blessed Theodore was from Mytilene. He was a family man with a wife and children. One day, he became angry over a turn of events, denied Christ, and became a Muslim. Alas for his rashness! Not long after, the darkness lifted, and Theodore came to his senses and repented. 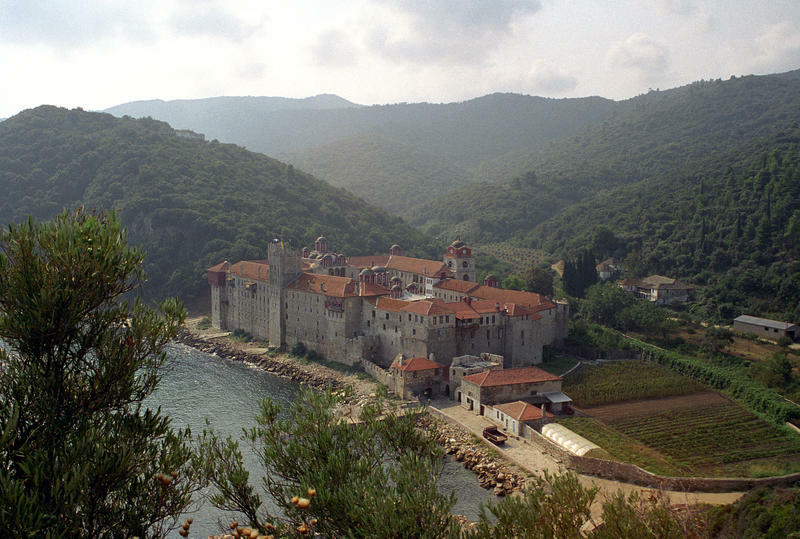 He left his home and sailed to Mount Athos, where he remained for a long time. Theodore confessed his sin and performed the prescribed penance. After he was anointed with the holy Chrism, received the immaculate Mysteries, and was cleansed, Theodore returned to his country. For the legs of her soul were not cut off. 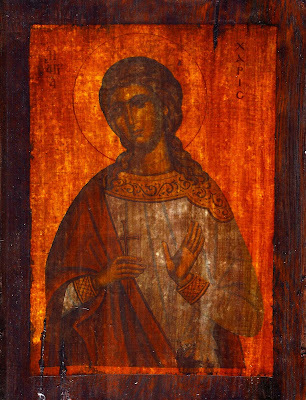 The Holy Martyr Charis, also known as Charitos, was martyred by having her legs cut off. She is celebrated on January 28th. The ritual year of the miraculous icon on Tinos starts on 30 January with the festival dedicated to the Finding of the Icon. 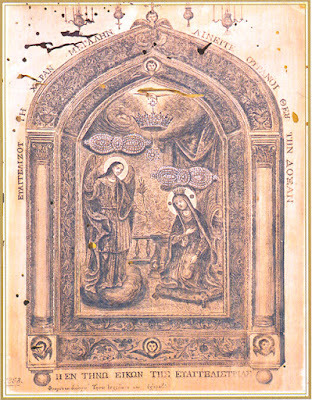 The next festival is dedicated to the Day of the Annunciation of the Virgin Mary, for from this the icon gets its name. July 23 is dedicated to the Vision of Saint Pelagia. 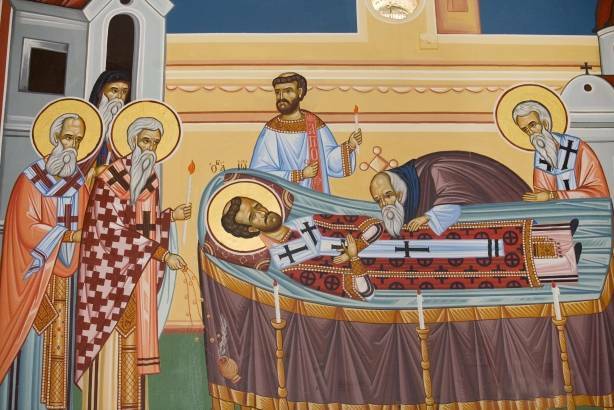 The most important festival, the Dormition of the Panagia, is celebrated on 15 August. Like a horse with smooth shackles at the hoof. Like a sharp razor with his fellow athletes. By the thoroughly depraved children of mercilessness. Entering as a freshly bathed bride. 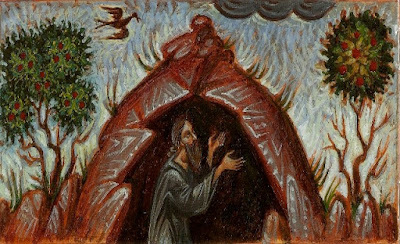 You gladdened Mount Sinai Ignatios. 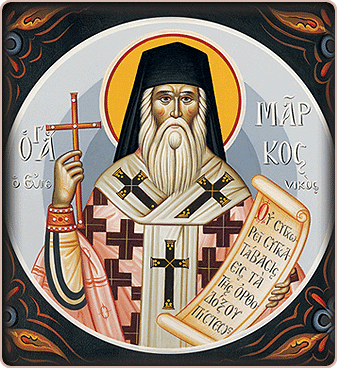 In the sixteenth century there was a very virtuous hieromonk named Ignatios from Rethymno in Crete at Sinai in the Monastery of Saint Katherine. Ignatios took Nikandros as his novice. Since both desired to know the monasteries and hermitages of Mount Athos, they went and remained there for five years. But they again returned to the place of their repentance at Sinai believing they could find more quietness, and there they lived for the rest of their lives. Made the cheers dull along with the wild lions. 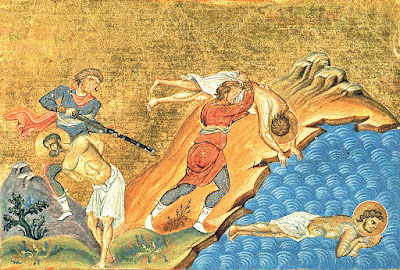 During the reign of Emperor Numerian (283-284), a persecution arose against the Christians. 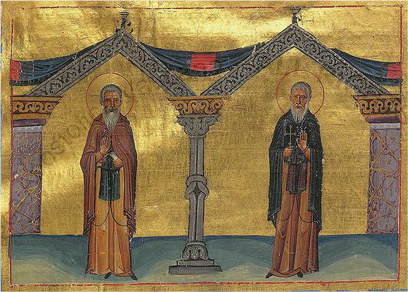 At that time Silouan, the Bishop of the city of Emessa which is in Syria, was denounced to the ruler there and immediately arrested, along with Deacon Luke and Reader Mokios, and the three stood before him bound together. After being interrogated, the ruler saw how they confessed Christ as the true God, and they anathematized the veneration of idols, therefore he became enraged. Being unable to persuade them with flatteries to renounce Christ, he had them harshly beaten and imprisoned, where he left them to die of hunger. In the Mixed Jury Criminal Court of Thessaloniki yesterday, 11 people faced felony charges, of which 8 were monks, for instigating violence and throwing molotov cocktails at police officers and others in July 2013 at Karyes. The Abbot of the Old Brotherhood of Esphigmenou Monastery, Methodios (Papalamprakopoulos), received a twenty-year prison sentence that was immediately enforced. Also, the primary attacker, Monk Antypas, was also convicted to twenty-years of prison, which was immediately enforced. The remaining 6 monks received prison sentences of ten years and four months as accomplices, which have been stayed pending retrial on appeal. Saint Ephraim was born in the early fourth century in Nisibis of Syria from parenta who were Confessors and Martyrs, as he wrote, "I am from a family of martyrs," for during the period of harsh persecution under Diocletian they gave their bold confession for the true God and they sealed it with the blood of their martyrdom. For a teacher he had Bishop James, a man of great theological education, who also ordained him a deacon. He received no other ordination. He was a true ascetic, a fiery orator and a famous writer. 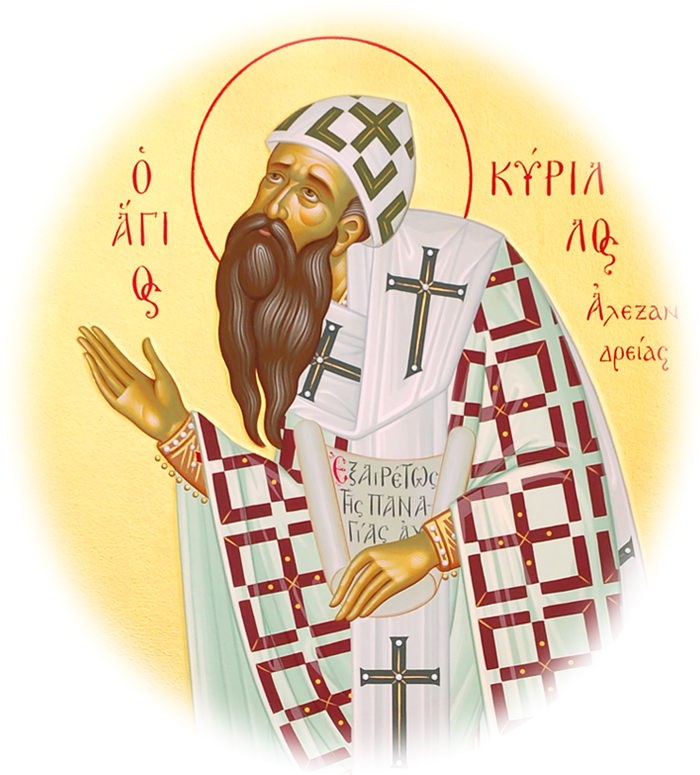 They called him a prophet of Syrians, a pillar of Orthodoxy, the mouth and lyre of the Spirit, and vessel of compunction. 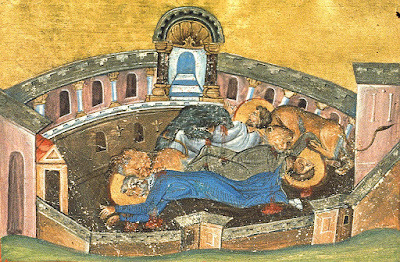 Shortly before his repose he visited Basil the Great in Caesarea of Cappadocia. He reposed in peace. A tongue he knew not calling him on high. On the twenty-eighth Ephraim’s soul was taken. Leap now Palladios to the celestial realm. 1. The celebrated Palladios was of the same date and way of life as Symeon [the Ancient (Jan. 24)], and his familiar and friend; in frequenting each other, it is said, they enjoyed mutual benefit, stimulating and stirring each other on to holy contest. He was immured in a cell near a large and well-populated village which has the name Imma.1 The man's endurance, fasting, vigils, and perpetual prayer I think superfluous to narrate, since in them he bore the same yoke as the godly Symeon. He lived in the sixth century. He was so perfected in pleasing God that James cured the most gravely ill through his prayers. But the enemy of mankind lured him into great temptations. At one time, an immoral woman was sent to him by some scoffers. She misrepresented herself to James, pretending to be crying yet all the while luring him into sin. Seeing that he was going to yield to sin, James placed his left hand into the fire and held it there for some time until it was scorched. Seeing this, the woman was filled with fear and terror, repented and amended her life. 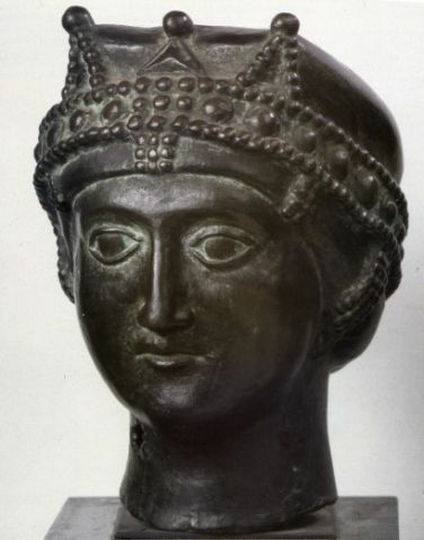 - From the Russian text "Anonymous Description of Constantinople"
the bust of Empress Euphemia is from the Museum of Nice. By Christ the King into His Kingdom. Marciana was the wife of Emperor Justin I (518-527), and is more commonly known as Euphemia, though originally known as Lupicina. 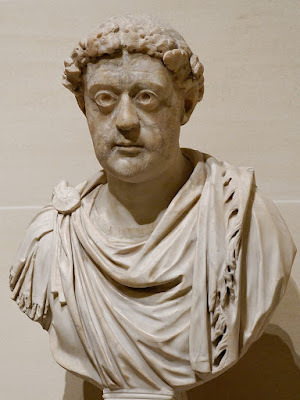 We know nothing of her origins, although Procopius in his Secret History says that Lupicina was both a slave and a barbarian, and asserted that she had been the concubine of her owner. Critics of Procopius (whose secret history reveals a man seriously disillusioned with his rulers) have dismissed his posthumously published work as a severely biased source, being vitriolic and pornographic, but without other sources, critics have been unable to discredit some of the assertions in the publication. Although its motives are suspect and it cannot be verified, its titillating nature has kept it as a popular reference. In Justin the First: An Introduction to the Epoch of Justinian the Great (1950), Alexander Vasiliev theorized that the original name of his wife (Lupicina) may indicate a linguistic association in another language with prostitution. Vasiliev connected the name to the Latin word "Lupae" (she-wolves). While the word in its singular Latin form "Lupa" could literally mean a female wolf, it also was the epithet or disparaging slur for the lowest class of Roman prostitutes. The derivative Latin word "Lupanar" was the name of a brothel in Pompeii. With Ananias also who entered with pleasure. These Saints lived during the reign of Emperor Diocletian, when Maximus was governor of Phoenicia. 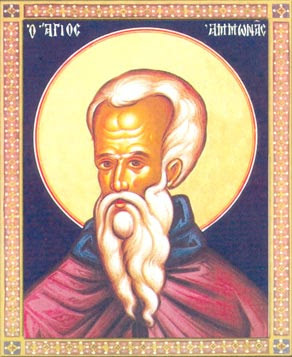 Saint Ananias was arrested and brought before the governor, and having confessed Christ he mocked the idols. For this reason he was beaten with rods, and his sides were burnt with red-hot spits. Then vinegar and salt was applied to his burnt members. After this the Saint through his prayers shook the temple, which caused the idols to fall to the ground. Therefore he was put in prison, and there he received food from God. By this miracle he attracted Peter the prison guard to faith in Christ, and together with him they were cast into the sea, at the order of the governor. 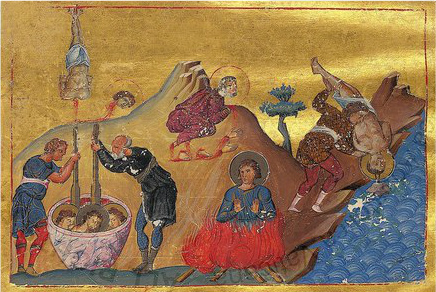 Together with them were seven soldiers who also were cast into the sea, for the Saint had also attracted them to faith in Christ, after he was astoundingly preserved unharmed when undergoing his torments. Thus all together the blessed ones received from Christ the crown of the contest. 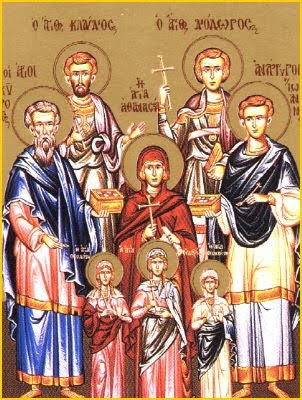 On the twenty-sixth of this month, we commemorate our Holy Father Xenophontos, his wife Maria, and his children Arcadius and John. It delights in the graceful banquet of his words. Xenophon with his wife and children died on the twenty-sixth. You found life that could never be filled. 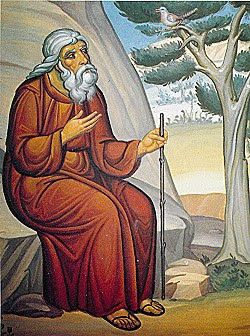 Abba Ammonas was Abba Anthony's disciple and successor on the Outer Mountain of Pispir. He had previously lived in Scetis for fourteen years in ceaseless prayer and granted victory over anger. He later became a bishop, probably by Saint Athanasius the Great. Several letters are attributed to him. Saint Gregory the Theologian, addressing the Apollinarian teaching, opposed it with a Christological teaching within the Tradition of the Church. 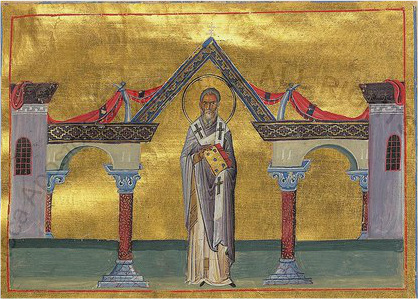 Saint Gregory clearly stresses in his letter to the Presbyter Cledonius: "I never have and never can honor anything above the Nicene Faith, that of the Holy Fathers who met there to destroy the Arian heresy; but am, and by God's help ever will be, of that faith; completing in detail that which was incompletely said by them concerning the Holy Spirit; for that question had not then been mooted, namely, that we are to believe that the Father, Son, and Holy Spirit are of one Godhead, thus confessing the Spirit also to be God." Therefore, the center of the Christology of Saint Gregory, we could say, is the Creed of Nicaea regarding the consubstantiality of the Son with the Father. Saint Gregory stresses the real union of the two natures, the divine and human, in the person of Christ. When the Son and Word of God was incarnated, He received the entire human nature for the salvation of the human race. 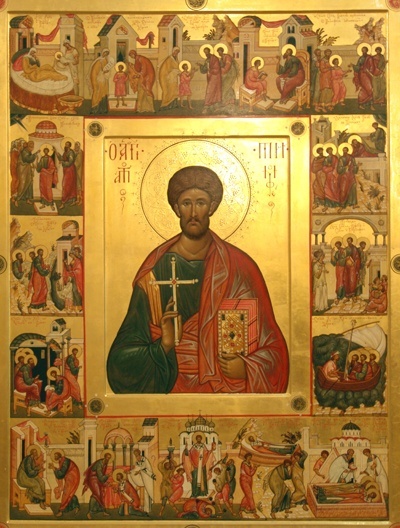 "For we do not sever the Man from the Godhead, but we lay down as a dogma the Unity and Identity of Person, Who of old was not Man but God, and the Only Son before all ages, unmingled with body or anything corporeal; but Who in these last days has assumed Manhood also for our salvation; passible in His Flesh, impassible in His Godhead; circumscript in the body, uncircumscript in the Spirit; at once earthly and heavenly, tangible and intangible, comprehensible and incomprehensible; that by One and the Same Person, Who was perfect Man and also God, the entire humanity fallen through sin might be created anew." Gregory goes on to explain: "If anyone does not believe that Holy Mary is the Mother of God, he is severed from the Godhead. If anyone should assert that He passed through the Virgin as through a channel, and was not at once divinely and humanly formed in her (divinely, because without the intervention of a man; humanly, because in accordance with the laws of gestation), he is in like manner godless. If any assert that the Manhood was formed and afterward was clothed with the Godhead, he too is to be condemned. For this were not a Generation of God, but a shirking of generation. If any introduce the notion of Two Sons, one of God the Father, the other of the Mother, and discredits the Unity and Identity, may he lose his part in the adoption promised to those who believe aright. For God and Man are two natures, as also soul and body are; but there are not two Sons or two Gods. For neither in this life are there two manhoods; though Paul speaks in some such language of the inner and outer man. And (if I am to speak concisely) the Savior is made of elements which are distinct from one another (for the invisible is not the same with the visible, nor the timeless with that which is subject to time), yet He is not two Persons. God forbid! For both natures are one by the combination, the Deity being made Man, and the Manhood deified or however one should express it. And I say different Elements, because it is the reverse of what is the case in the Trinity; for There we acknowledge different Persons so as not to confound the persons; but not different Elements, for the Three are One and the same in Godhead." 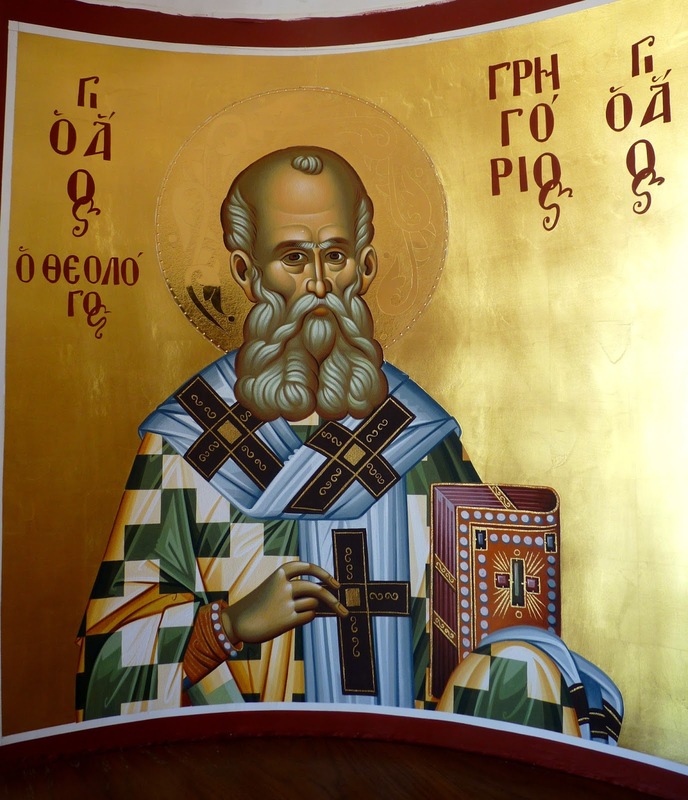 In confronting the positions of the Apollinarians regarding the incarnation of the Word, Saint Gregory presents a Christology directly related to Soteriology. "If anyone has put his trust in Him as a Man without a human mind, he is really bereft of mind, and quite unworthy of salvation. For that which He has not assumed He has not healed; but that which is united to His Godhead is also saved. If only half Adam fell, then that which Christ assumes and saves may be half also; but if the whole of his nature fell, it must be united to the whole nature of Him that was begotten, and so be saved as a whole." 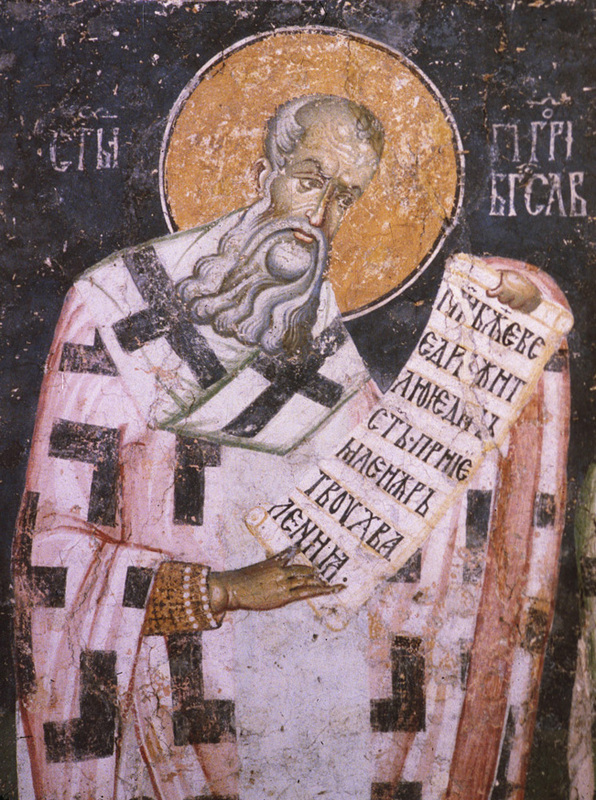 It should be noted that, because Saint Gregory refers to the union between the divine and human hypostasis in the person of the Word, he uses the terms "μίξις" (mingling), "κράσις" (blending), "σύγκρασις" (blending together) and "συμφυΐα" (unite). With these terms Saint Gregory stresses the real union between the two hypostases in the person of the Word, without meaning the deterioration of each of the two natures. Thus God the Word received human nature and He exalted and deified it. The Son of God now descends to the world as the God-man and offers people the opportunity to become deified. People now have the opportunity to become immortal, because it was done by God the Word. 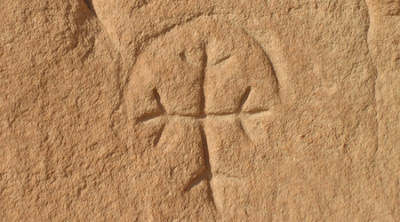 "The Word of God Himself — Who is before all worlds, the Invisible, the Incomprehensible, the Bodiless, Beginning of Beginning, the Light of Light, the Source of Life and Immortality, the Image of the Archetypal Beauty, the immovable Seal, the unchangeable Image, the Father's Definition and Word, came to His own Image, and took on Himself flesh for the sake of our flesh, and mingled Himself with an intelligent soul for my soul's sake, purifying like by like; and in all points except sin was made man. 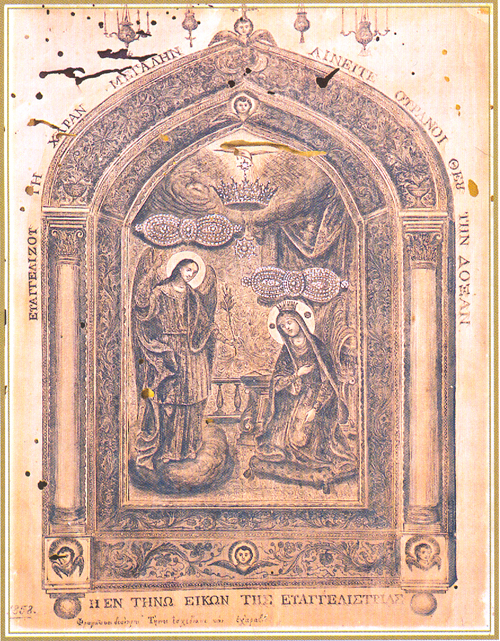 Conceived by the Virgin, who first in body and soul was purified by the Holy Spirit (for it was needful both that Childbearing should be honored, and that Virginity should receive a higher honor), He came forth then as God with that which He had assumed, One Person in two Natures, Flesh and Spirit, of which the latter deified the former. O new commingling; O strange conjunction; the Self-Existent comes into being, the Uncreated is created, That which cannot be contained is contained, by the intervention of an intellectual soul, mediating between the Deity and the corporality of the flesh. And He Who gives riches becomes poor, for He assumes the poverty of my flesh, that I may assume the richness of His Godhead. He that is full empties Himself, for He empties Himself of His glory for a short while, that I may have a share in His Fullness. What is the riches of His Goodness? What is this mystery that is around me? I had a share in the image; I did not keep it; He partakes of my flesh that He may both save the image and make the flesh immortal" (Oration 38, On Theophany). 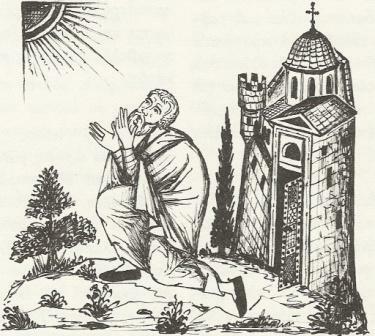 Source: Ekklesiastiki Paremvasi, "Ἡ Χριστολογία τοῦ Ἁγίου Γρηγορίου τοῦ Θεολόγου", March 2005. Translated by John Sanidopoulos. 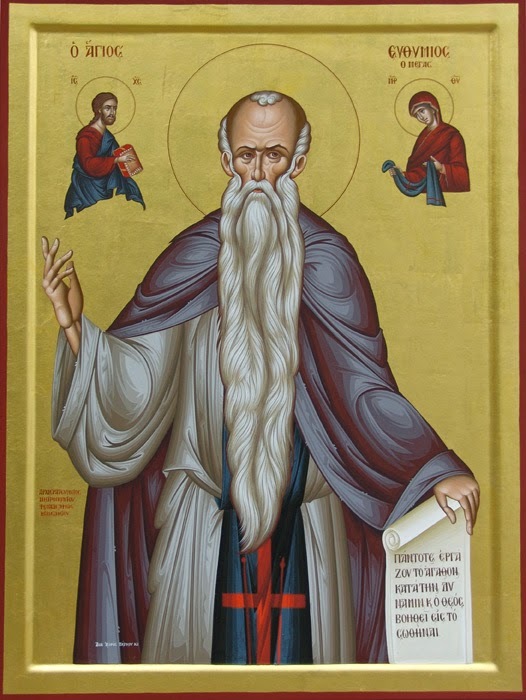 Gregory of Nazianzus (329-389) was one of the great defenders of the orthodox faith (as defined in the Nicene Creed) during the second half of the fourth century. His famous discourses on the Trinity did much to revive the strength of the orthodox party in Constantinople, where he served as archbishop from 378 to 382. His pronouncement on the canon was given towards the end of his life, in the form of a poem: "Concerning the Genuine Books of Divinely Inspired Scripture," reproduced below. Like Athanasius, his enumeration of the Old Testament books omits Esther. The Revelation of John is also missing from his list of the New Testament books, due to a general reaction against this book in the east after excessive use was made of it by the Montanist cults. At a divine height you attained divine love. 1. There is a village called by us Omeros. 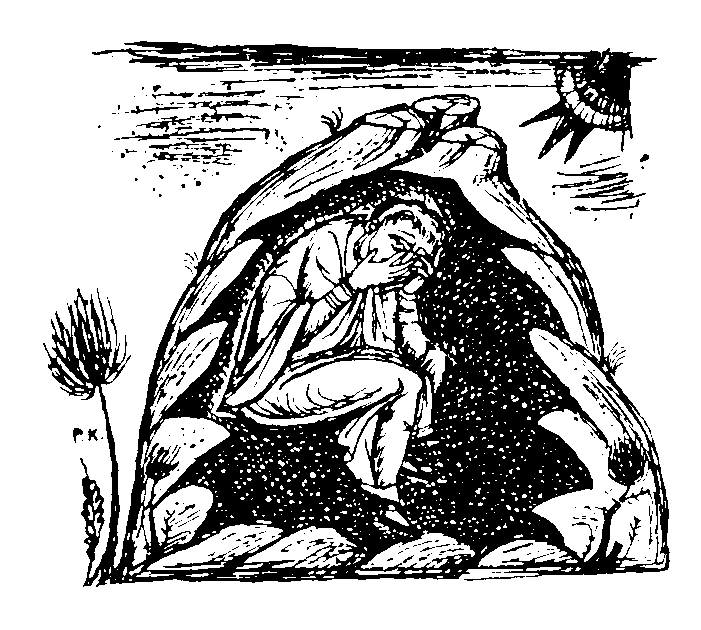 Here the inspired Maris built a small hut and continued immured in it for thirty-seven years.1 It received much rain from the neighboring mountain; in the winter season it even poured out streams of water. Both townsmen and countrymen are aware what harm this causes bodies; to the peasants are manifest the diseases that are produced thereby. Nevertheless, not even this induced this sacred person to change his cell, but he maintained his endurance until he had accomplished his course. Shattering all the impudence of the evil one O Apollo. And we saw also another priest, whose name was Apollo, who lived in the Thebaid, on the borders of Hermopolis, where our Redeemer went with Mary and Joseph, that there might be fulfilled the word of Isaiah (19:1), who said, “Behold the Lord is mounted upon swift clouds and shall go into Egypt, and the idols of Egypt shall tremble before Him, and shall fall upon the earth.” And we also saw there the house of idols wherein all the idols that were in it fell down upon their faces on the ground when our Redeemer went into that city. And we saw, moreover, that this man who dwelt in the desert was the Abba of five hundred monks who lived in the monasteries which stood around the base of the mountain, and that he was exceedingly well known throughout the land of Thebaïs; for he possessed the excellent virtues of the ascetic life, and God performed many great and mighty deeds through him, and very many signs took place by his hand. And this man Apollo, whose ascetic labours were so wonderful from his youth up, in the time of his old age was held to be worthy of an act of grace from God, for when he was eighty years of age he took possession of a great monastery containing five hundred marvellous men, who were also able to work miracles, and when he was fifteen years [older] (i.e., when he was ninety-five years of age), he departed from this world, having lived for forty years in the inner desert, where he led a perfectly spiritual life. 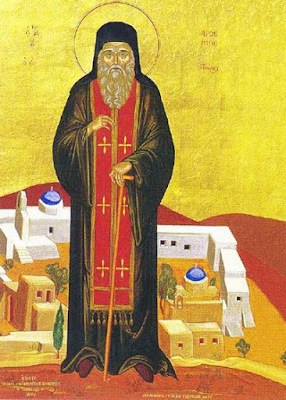 Saint Neophytos was born in Lefkara of Cyprus in 1134. His parents were poor, but pious and virtuous. They had eight children, to which, due to their economic situation, they were not able to give any other education except that of piety. 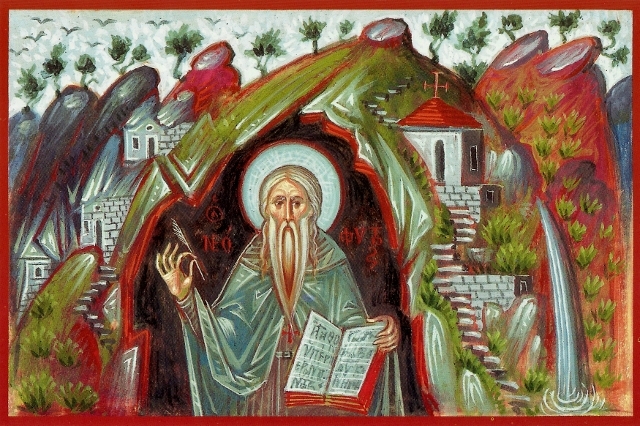 Saint Neophytos however, due to his great love of learning, learned letters at the Holy Monastery of his repentance, and even became an author. At the age of seventeen or eighteen his parents arranged for his engagement to be married, as was the custom at the time. 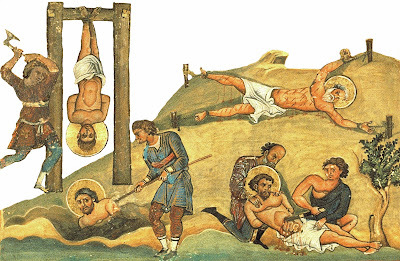 Ultimately, however, they succumbed to his insistence and allowed him to be free to become a monk at the Monastery of Saint John Chrysostom at Koutzoventi. Macedonios O Christ received one. 1. Macedonios,1 called the Barley-eater - for this food won him the name -, is known by all, Phoenicians, Syrians, and Cilicians, and known too by the neighbors bordering on them, of whom some were eyewitnesses of the man's miracles, while others heard reports that celebrated and circulated them. Not all know everything, however, but some have learnt this and others that, and naturally they admire only what they know. I, who possess more accurate knowledge than others concerning this sacred person - for I had many incentives to go to him and go often -, shall relate each point as I may be able. I have reserved this position for him and placed his story after many others, not because he was second to the others in virtue - for he was a match for the perfect and first - but because, having lived an especially long time, he came to the end of his life after those whom I have recalled already. Were seen to be fellow athletes in the stream of the river. With which Theodotion cried out with divine longing. 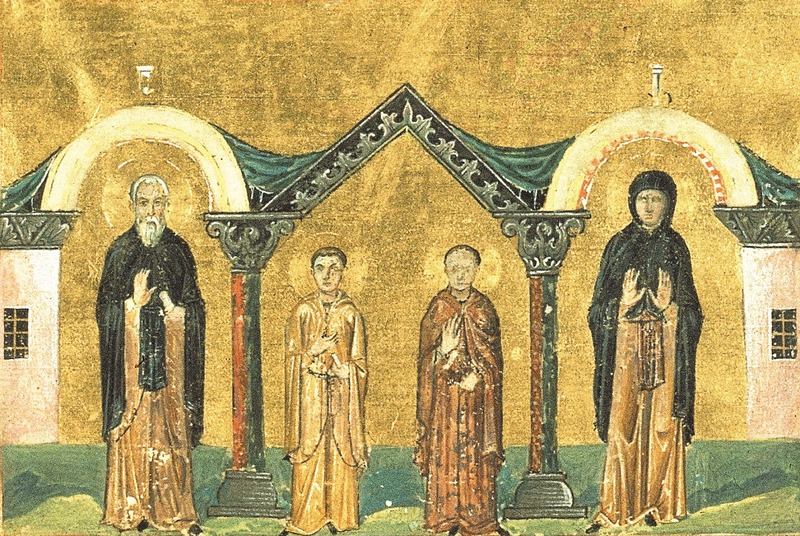 These three Saints were brothers according to the flesh and lived during the reigns of Emperors Diocletian (284-305) and Maximian (285-305), when Arianus was governor of Cleopatridis, which can be found in Egypt, and today is called Suez. Paul and Pausirios became monastics at a young age, while Theodotion lived in the mountains with the bandits. After being arrested for being Christians, Paul, who was thirty-seven years of age, and Pausirios, who was twenty-five, boldly confessed their faith in Christ before the governor. 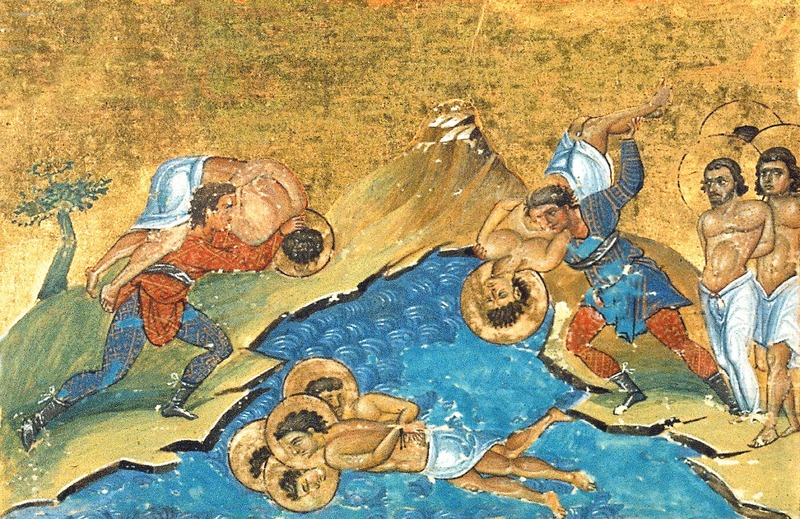 When their brother Theodotion learned of their arrest, he came down from the mountain and abandoned his thievery and went to see them in order to bid them farewell. And now you delight together with the fleshless intelligences. Saint Dionysios was born in the last years of the fifteenth century to pious Christian parents in the village of Slatina (now called Drakotrypa) in Thessaly. 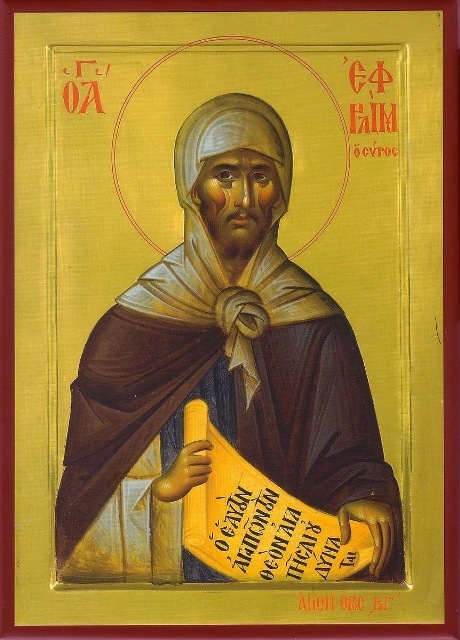 After their death, the lad earned his living for a while as a teacher and scribe but, consumed with zeal for the things of God, he made his way before long to the Monastery of the Transfiguration at Meteora, where he became the disciple of an elder named Savvas. 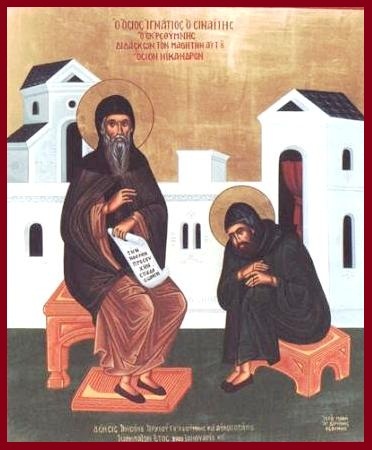 He had not long been wearing monastic clothing (a cassock) when, hearing praise of the hesychast life, ascesis and prayer of the monks of Athos, he fled there, unknown to his elder, who had wanted to keep him by force. 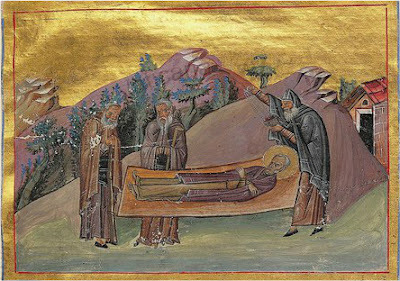 On reaching Karyes, the capital of the Athonite community, he asked to be received into the brotherhood of Elder Gabriel, who was renowned for his wisdom, but they sent him back to the world to stay first of all with the Bishop of Cassandra. However on reaching the required age, Dionysios received the Great Angelic Schema at the hands of Gabriel who, discerning his qualities, soon had him ordained deacon and then priest in order to take over the duties in the services at the Protaton. The zeal of Dionysios for ascesis and his love of prayer won the admiration of young and old alike, and he had no difficulty in obtaining his spiritual father's permission to enter upon the fierce contests of the eremitic life in a cold, forsaken place not far from the Monastery of Karakallou. Tongues of Angels now speak of him to Angels. 1. Know that many other luminaries of piety have been conspicuous near Antioch: Severus the Great, Peter the Egyptian, Eutychius, Cyril, Moses, and Malchus, and very many others who trod the same path;1 but if we were to try to record the life of them all, limitless time would not be enough for us. In any case, the reading of a long account is for most people tedious. Judging therefore the lives of those omitted from those recorded, let everyone praise and emulate them, and reap benefit. I myself shall pass over to the meadows of Cyrus, and display, as far as is possible, the bloom of fragrant and beautiful flowers therein. The delightful intelligences said to Eusebius. Approached the mouth of the sword thirsty for blood. 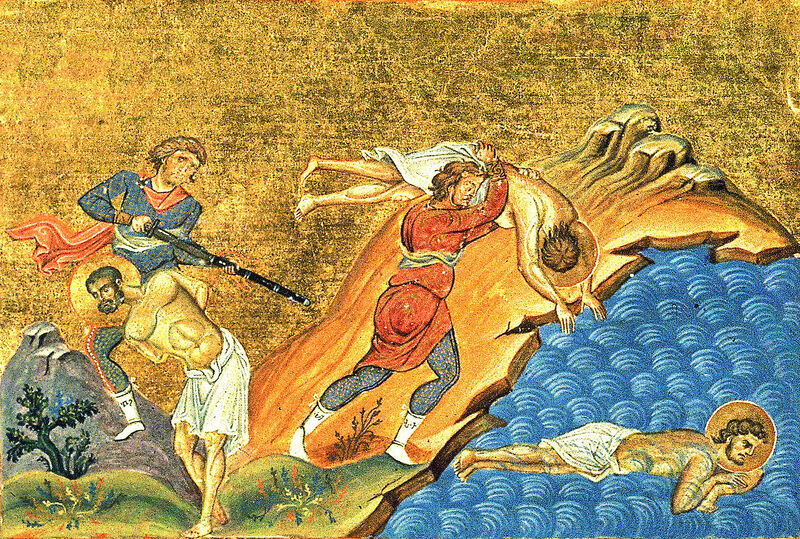 On the twenty-third Agathangelos and Clement were beheaded. 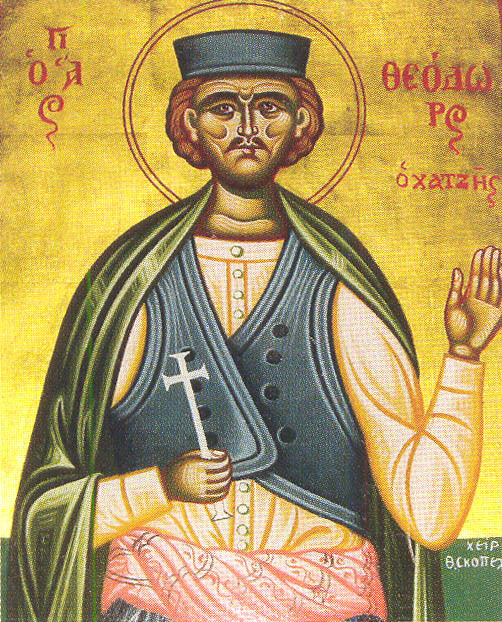 The Hieromartyr Clement was born in the Galatian city of Ancyra in the year 258, of a pagan father and a Christian mother named Euphrosyne. He lost his father when he was an infant, and his mother when he was twelve. She foretold a martyr's death for him on her deathbed. You were beaten with sticks that painted the earth with your blood. On the twenty-second your spirit was raised Timothy. 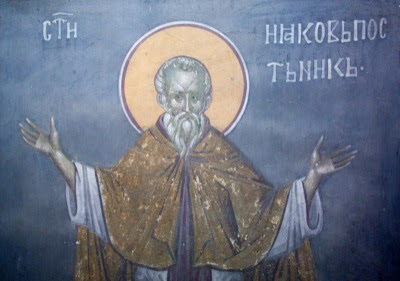 Saint Timothy was from the city of Lystra in the province of Lycaonia, in the confines of Isauria, which is beneath Iconium. His father was a pagan called Ellinos, and his mother was a Jew called Eunike (Eunice). 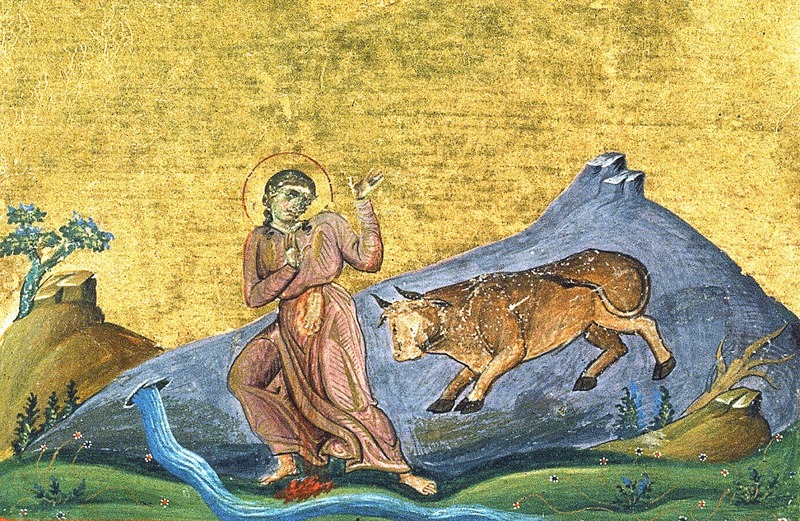 The Apostle Paul would later praise Timothy's mother and grandmother because of their sincere faith: "I yearn to see you again, recalling your tears, so that I may be filled with joy, as I recall your sincere faith that first lived in your grandmother Lois and in your mother Eunice and that, I am confident, lives also in you" (2 Tim. 1:4-5). Timothy first met with the great Apostle in Lystra and was himself a witness when Paul healed the one lame from birth. Having learned the Christian faith from the Apostle Paul, and after being baptized by him, he became his co-worker, constant traveling companion and fellow preacher of the divine gospel. He traveled with him to Jerusalem, Achaia, Macedonia, Italy and Spain. Sweet in soul, he was a great zealot for the faith, and a superb preacher. Paul calls him "my own son in the faith." "Paul, an apostle of Christ Jesus, Who is our hope, to Timothy, my own son in the faith: grace, mercy and peace from God our Father and Jesus Christ our Lord" (1 Tim. 1:1-2). This Saint was from the island of Sicily, the son of pious and faithful parents, who passed their lives self-sufficient and in good works, and they had property near the Monastery of Saint Lucy the Virgin. After the Saint was born and weaned from his mother's milk, his parents gave that property as a gift to Saint Lucy, along with their son Zosimos. Thus the Saint was raised in the Monastery, having been dedicated to God before he was born. And the Abbot of that Monastery, educated him in the education and admonition of the Lord, carefully teaching him the rules and traditions of the Church. Having a good natural disposition of the mind, and being diligent in his studies, in no time he attained all the virtues, and acquired every good work speedily and diligently. He had patience and perseverance, and was enriched with obedience and purity. Having achieved these things, he was given charge over the relics of Saint Lucy, namely he was the caretaker (prosmonarios) and servant of the holy relic. Due to their nobility of soul are beheaded by the sword. These Saints suffered martyrdom during the reign of Diocletian (284-305) and Maximian (286-305), when Lysias was military commander (doukas). 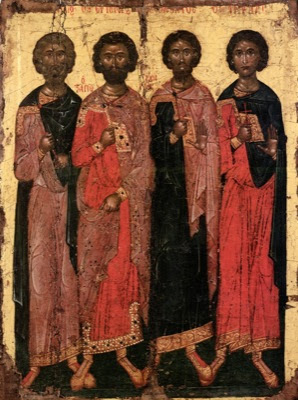 Due to the bloody and cruel persecution launched against the Christians, many of the faithful fled to the mountains of Trebizond in Pontus, among whom were these four Saints. 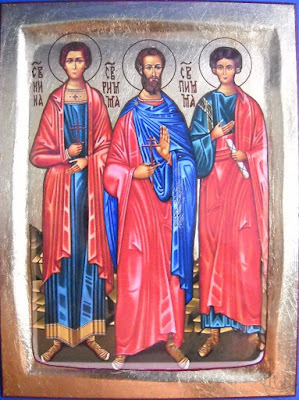 Three of them - Valerian, Candidus and Aquila - were captured by soldiers of Lysias, and having confessed Christ as the true God, they were banished to a narrow fortress named Pityous, which was in Lazika. From there they were brought to Trebizond and stood before Lysias. It was ordered by him that they be flogged with the sinews of oxen. After this they were suspended and torn at with iron claws, then their wounds were burned with lit torches. As the executioners were inflicting these torments, they became exhausted and fell to the ground prostrate, which agitated Lysias, and he ordered the Saints be thrown into prison. Icy Inna, Pinna and Rimma. 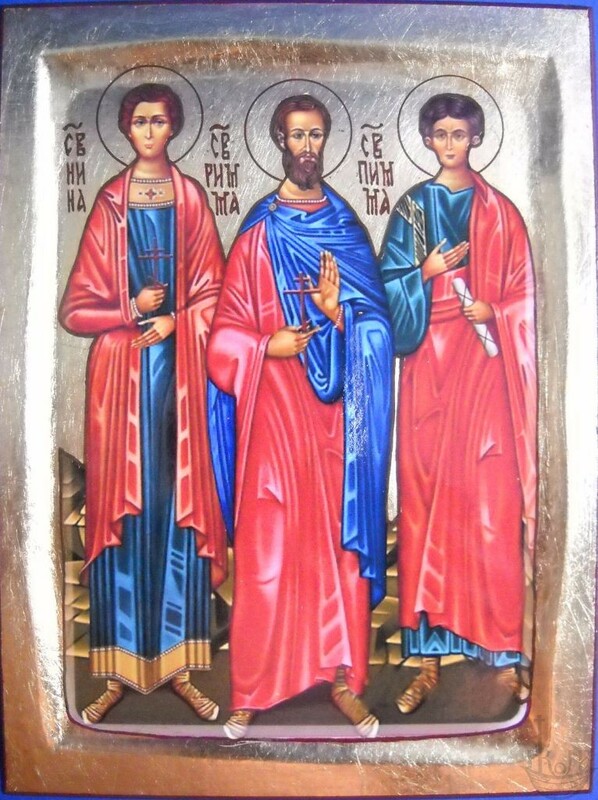 These three Holy Martyrs were from a certain land situated in the northern regions. 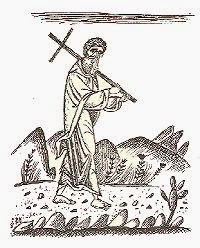 Being disciples of the Apostle Andrew, they helped convert many Goths who had settled around the Danube River, near Varna in Bulgaria. After being captured by the idolatrous barbarians, they were brought before the leader of the land. Having confessed Christ, they were sentenced to die by being exposed to the cold. The Orthodox faith remains undivided. Honoring God as three divine persons. Basilides is struck in the belly. Christ Lord the heavenly-ruler crowned. Ruling the Roman Empire for seventeen years, Leo proved to be a capable ruler. He oversaw many ambitious political and military plans, aimed mostly for the aid of the faltering Western Roman Empire and recovering its former territories. He is notable for being the first Roman Emperor to legislate in Greek rather than Latin. What common thing about your life was there Euthymios? You carried off to the Angels those with an unusual life. Your life ceased on the twentieth well-bearded Euthymios. 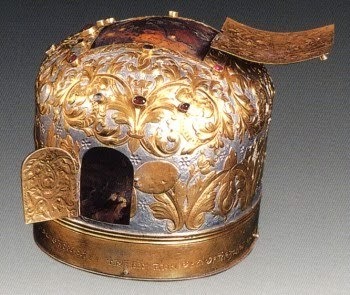 Translation of the Sacred Relic of Saint Euthymios the Great in 473 A.D.
And truly you contested by the sword Euphrasia. 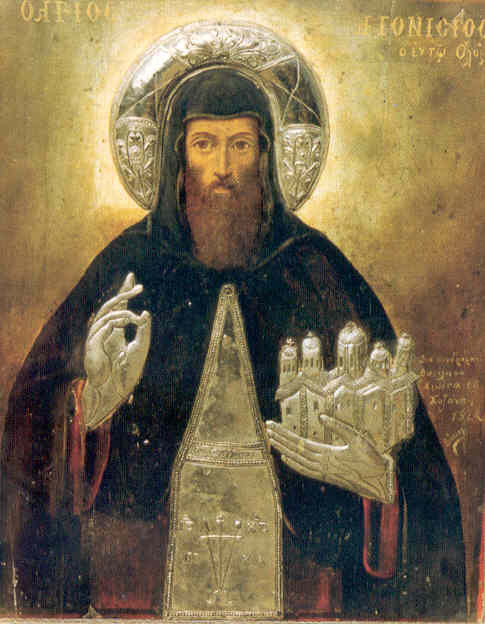 This Saint was from the city of Nicomedia, and lived during the reign of Emperor Maximian (285-305). She was from a notable family, and was of a sensible and pious mind. After being betrayed as a Christian, and being unpersuaded to offer sacrifice to the demons, she was harshly lashed. 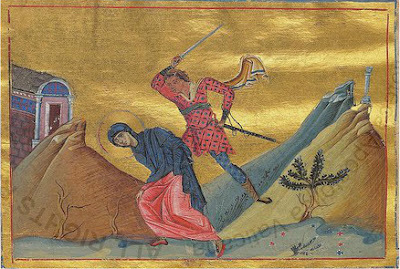 Remaining steadfast in her confession of the Christian faith, for this reason she was handed over to a barbaric man in order to be dishonored. However the Saint fooled him in this wise manner. 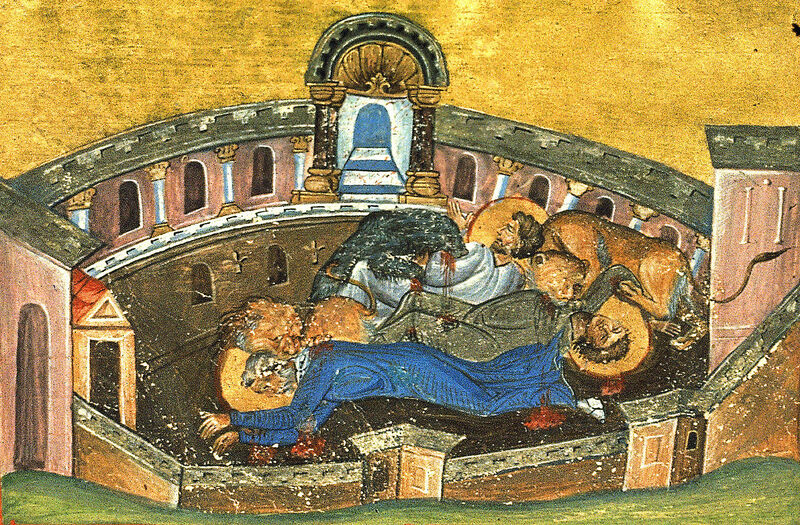 Saint Mark, was born with the name Emmanuel, in 1392 in the queen of cities, Constantinople. He came from pious parents, his father was called George and was a chief justice, a sakellarios, and a deacon of the Great Church, and his mother was Maria, the daughter of the pious physician Luke. Both parents tried and succeeded in raising little Emmanuel in the teachings and admonition of the Lord. But the death of his father left him and his younger brother John orphans at a tender age. The Saint learned his first letters from his father George, who had a famous private school. After the death of his father, his mother sent him to continue his studies with the most famous teachers of the time, John Chortasmenos (later Metropolitan Ignatios of Selymbria) and the mathematician and philosopher George Gemiston Plethon. Among his classmates was his later sworn enemy Bessarion the Cardinal. 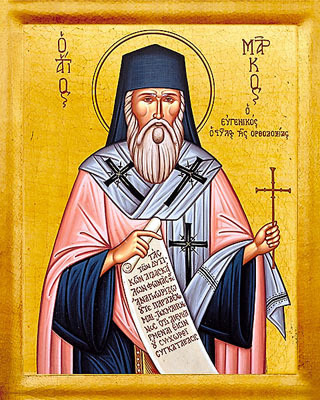 Makarios of Alexandria, born around 296, was a tradesman, a seller of sweetmeats. He went to visit Abba Pachomios at least once during Lent. 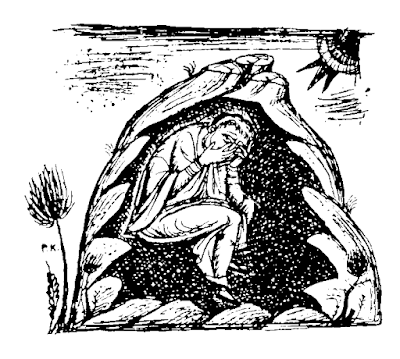 He was a hermit and priest in the Cells, famous for extreme asceticism; one of his disciples was Paphnutios. He died about 393. Sharing in the most blessed life. On the nineteenth the Makarii obtained the blessed land. Placing her hopes in God as a servant. You were made worthy of the glory of Christ by the sword. You behold the Lord, Makarios and Evagrios. Departing to the Lord Who is the Lord of all. On the ninth Cyril found the day of the grave.